It’s not unusual to see kids as young as 18 months interacting with tablets these days. In fact, my own children were obsessed with my iPad from very early on, and it led me to research what might be the best (and most affordable) tablet for kids. We settled on a Kindle Fire, for a variety of reasons, and we’ve never looked back. Our family now has three Kindle Fires for the kids to use. With so many opportunities to incorporate entertainment and education into our daily lives, these devices have become a staple for streaming video, gaming, and even learning new languages. The oldest kids use it for more serious gaming and ebook learning, while the toddlers have enjoyed many learning apps, including those that have helped them read, count, and draw. Some of my 6-year-old’s first words were in Chinese—something we only discovered after watching him interact with an engaging language app! Buying electronics for kids can be daunting, however. Tablet needs must be balanced with value, durability, and what kids really like. That’s why the Kindle Fire has come out on top year after year as one of the best tablets for kids. Bundled with an Amazon Prime account and FreeTime Unlimited (a treasure trove of kid-friendly videos, apps, and more), it can’t be beat for the price and features. Here’s everything you need to know to choose the right model and set it up for years of quality tech time with your child. 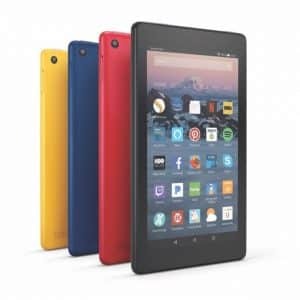 The smallest and lightest of the Fire tablets, the Fire 7 features a seven-inch display, 8GB of storage (which you can expand with a microSD card), and best of all, a wallet-friendly $50 price tag (which regularly gets discounted to $40). Want more internal storage? A 16GB version of the Fire 7 sells for $60. If you want something with a better screen and sound, you might want to snag this tablet. Starting at $79.99, the Fire HD 8 comes in either 16GB or 32GB storage capacities, and it also boasts 12 hours of battery life. You’ll also get an upgraded display with 8 inches of HD (1280 x 800) resolution, and stereo speakers with Dolby-enhanced sound. 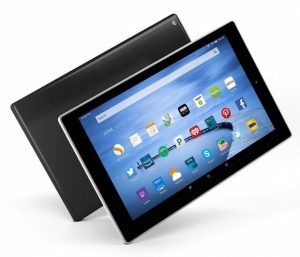 For the biggest Kindle Fire screen yet, the Fire HD 10 is priced at $229.99. Available with up to 64GB of storage, the 10-inch Fire tablet features a much better front facing camera (720p HD vs. SD on other versions). The Fire HD 10 is also the most grown-up looking version of the Kindle family, with a thinner design and the option for a premium silver finish. Amazon has made it almost too easy for parents to pick the right tablet for kids. They offer “Kids Edition” packs for both the Fire 7 and HD 8, priced at $99.99 and $129.99, respectively. What do you get for the almost $50 price increase over buying the tablet à la carte? 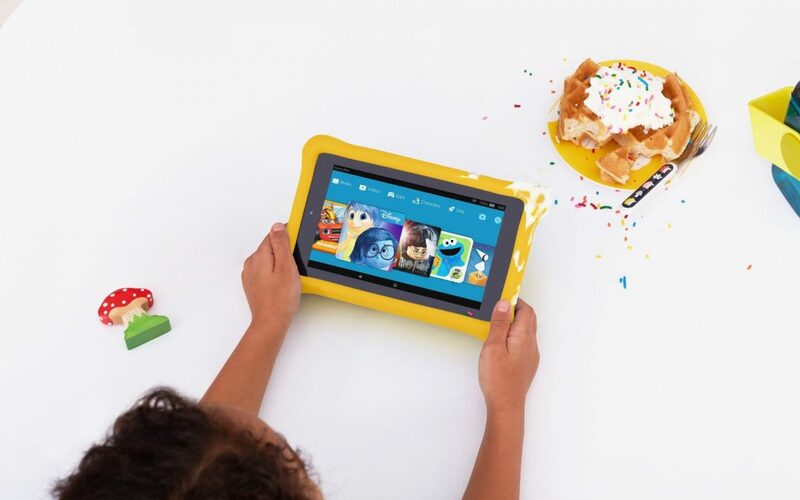 The Kids Editions include a kid-proof case, one year of FreeTime Unlimited service (which normally sells for $119 a year, or $83 if you’re a Prime member), and a two-year “worry proof” replacement and repair warranty. In all honestly, we’ve done just fine with the standard Kindle Fire 7 and a case we bought for around $15 from a third-party Amazon seller. Kindle Fire tablets are not indestructible, but they’ve taken quite a few drops and spills in our rough-and-tumble household, so our family never bothered with the 2-year warranty. Special Offers: What Are They? When purchasing the stand-alone Kindle, you’ll find that you can only get the lowest price advertised by picking the “With Special Offers” version of the Kindle. What are Special Offers, exactly? The bad news: they’re ads. The good news: the ads only show up as a screen saver between Kindle Fire sessions. Most Special Offers ads are for Amazon services, ebook launches, or household brand names we are all familiar with. Every Special Offers ad I’ve seen so far has been kid-friendly. Finally, ads never appear when the kids are in FreeTime mode on the Kindle. On a budget? Look for refurbished models of the Kindle Fire tablets. We’ve bought two refurbished Kindle Fire tablets ourselves, and couldn’t be happier. The savings were significant, allowing us to upgrade the storage capacity to the next level for the same price as the new, base model. For example, a refurbished 32GB Kindle Fire 10 is $30 cheaper than buying new, and it’s also the same price as a new 16GB Fire 10. Fire tablets are incredibly durable and easy for little hands to use. The magic, though, is in Amazon’s FreeTime Unlimited service, which offers a world of parent-approved movies, games, apps, ebooks, and TV shows without the danger of accidental in-app purchases. The app requires a $5/month subscription fee to access, or $3/month for Prime members. If you have more than one child, consider upgrading to the Family Plan, which allows each child in your home to have their own profiles for saved games, apps, and parental controls. A Family subscription goes for $10/month ($7/month for Prime members) or $119 annually ($83 with Prime). There’s also a one-month free trial if you’d like a sample before coughing up any dough. Here’s my favorite part of the Kindle and its accompanying Freetime app: the controls. Parents simply need a four-digit PIN to switch between the regular Kindle interface and the FreeTime app. Kids can’t switch between profiles without it. Before allowing your kid to play, you have the option of setting time limits by day, restricted hours, and even content parameters. Don’t want your kid to play the latest Star Wars app before she has gotten in 20 minutes of ebook reading time? You can set that up! Simply set it up to lock them out after a set time. Who is the Kindle For? 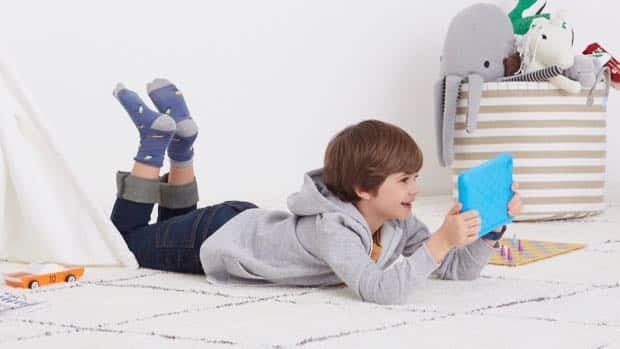 While we have allowed our younger children to use the Kindle for their games and apps, older kids will find it useful, as well. The FreeTime app gives parents the ability to filter content based on age, while also letting you add specific games, shows, books, and more as you dictate. If a child needs to read an ebook or play a math game for school, you can go outside the FreeTime realm and purchase it for your child. It is completely, and beautifully, flexible. 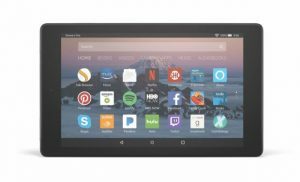 No tablet is perfect, and while we’ve only had a few issues with the Kindle Fire tablets we’ve owned, they can cause the fun and games to come to a screeching halt. No one wants to be on a crowded airplane when the baby’s beloved episode of “Yo Gabba Gabba” freezes and dies, so check out these must-read hacks. Estimate your storage needs. Unless your kids are very young, you have just one child using the tablet, or you are a master at managing storage by deleting silly kid-produced videos every day, you’ll want to go with at least 16GB of storage. Most apps don’t take much space, but after awhile, all those apps you’ve installed will start to add up. Clean up frequently. My toddler once took about 300 photos of the kitchen floor because he liked the sound of the camera made. You’ll want to keep tabs on junk that accumulates and delete it ASAP. Beware of lockouts. Kids should know the rules and not try to bypass your PIN for any reason. That said, you may find yourself locked out of your Kindle after 99 attempts of your toddler trying to guess the password. If that happens, don’t panic – the Amazon support team is very helpful. Keep them on speed dial for instances such as this. I’m always amazed at the mileage we get out of our Kindle Fire tablet. We’ve owned many Fire tablets over the years, and they have excellent battery life, they’re easy to use, and they deliver great bang for the buck. If you ask me, there is no better option for the money than the basic Fire 7 with upgraded storage. 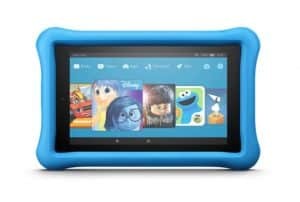 If you’re shopping for a tablet for kids, keep your eyes open for one of Amazon’s frequent Fire sales (no pun intended). Also, bundle deals are a great way to stock up for holidays, birthdays, and graduation presents. What type of tablet have you used with your children? What feature do they like the best? Linsey Knerl is a freelance writer, mom of 6, and member of the ASJA specializing in parent and consumer news. You can find more of her work at LinseyKnerl.com or follow her on Twitter. If you buy something through our buying guides, we may earn some money. Thanks for the support!